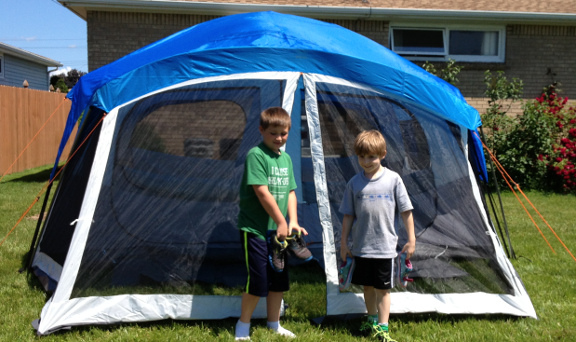 For Christmas 2012, I received the HKD Global 9 Man Tent. Due to a noticeable lack of information on the web, I had wait until June 2013 to set it up to see what it looked like. 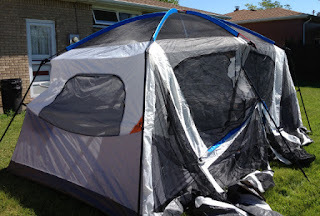 UPDATE - it looks like this tent is discontinued. If you have one treat it well. 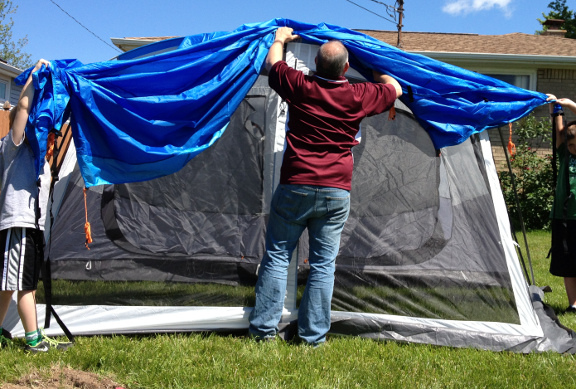 If you need one, try the Embark 8 man tent. It’s great. I couldn’t ask for a better tent, but like all tents, the instruction sheet is poor. The condensed instructions on the inside of the carry bag are handy, but without seeing the assembled product, they are too sparse. Setup is easy, but does require time and two people. Start by opening the bag and the cardboard box. Do not use a knife, just peel the tape away. Find the envelope with the instruction pamphlet. 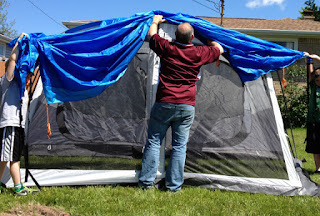 The first step is to spread the whole tent out. 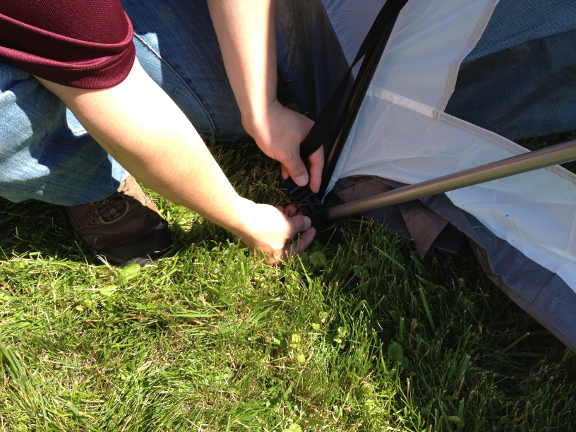 Remember, you have both a tent and a rain fly. 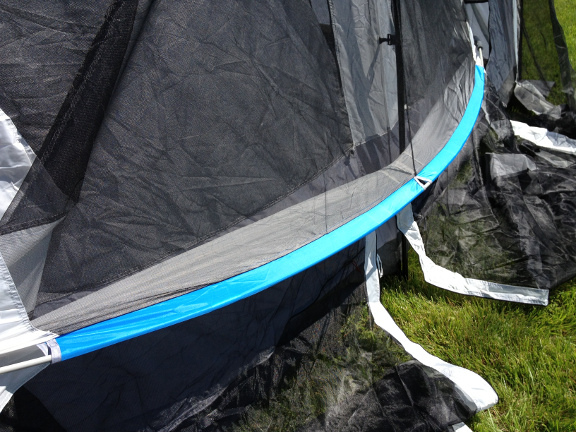 The tent is largely screen mesh, the fly is blue and solid. Put the fly aside for now. Next, stake the four corners at the metal rings. There are six rings total, you will skip two of them. Next, find the A poles. These are long fiberglass poles with 7 sections. Assemble them and slide them diagonally into the sleeves. Next pick up the reddish orange five section B pole and slide it into the sleeve from front to back. All fiberglass poles have sleeves. There are six plastic elbows, two red and four black. Make sure that the elbows are facing the right way by checking that the nylon strap is not twisted. As a double check, the small fiberglass poles fit into side with smaller internal diameter. Now you will need some help. Assemble the 6 black steel poles and insert into the elbows. Metal poles do not have sleeves. The stake ring has one or more pins. Place a pin inside of the pole to secure it to the ground. I found it easier to stand the posts up in the elbows, then work my way around the tent putting the pole on to the pin. 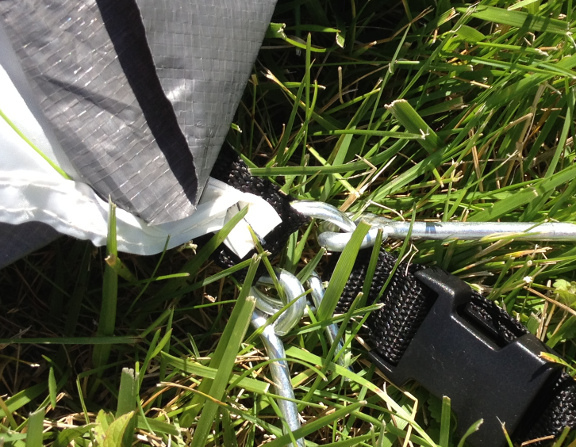 Now use the Vecro straps to secure the tent edges to the metal poles. Now spread out the mesh entryway and slide the last grey fiberglass pole into the sleeve and then the elbows. Now for the grey steel poles. Insert them into the elbows and then use the remaining pins on the ground. These poles also have Vecro straps. With this step complete, work your way around all of the steel poles and snap the plastic clips together at ground level. 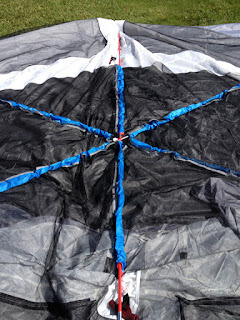 Now gather the whole fly together and lift it on to the top of the tent. When this step is done, again check to make sure the logo is on the front left side of the tent. Next grab the remaining stakes and find the orange tie downs. 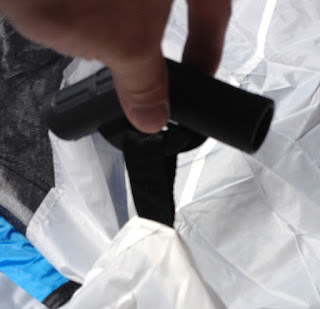 Unwind and pull the tie down into a loop using the plastic slider. 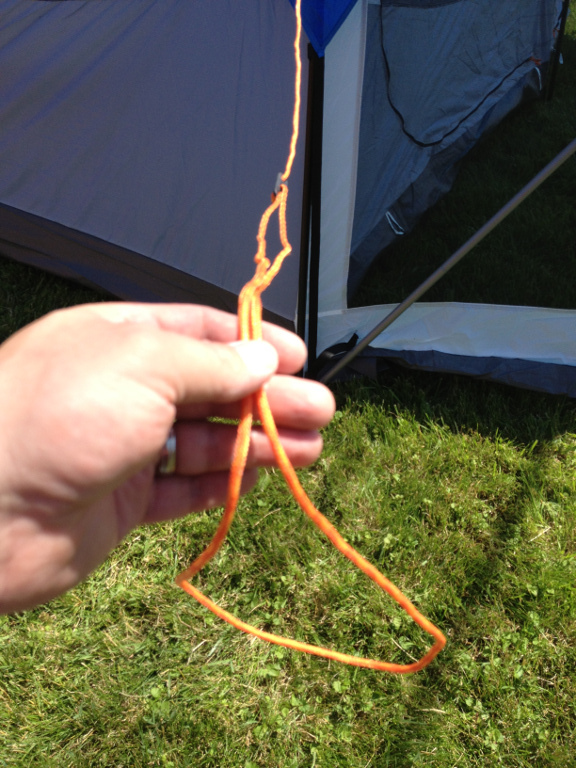 Stake them down about 2 or 3 feet from the side of the tent. Location will determine the distance. 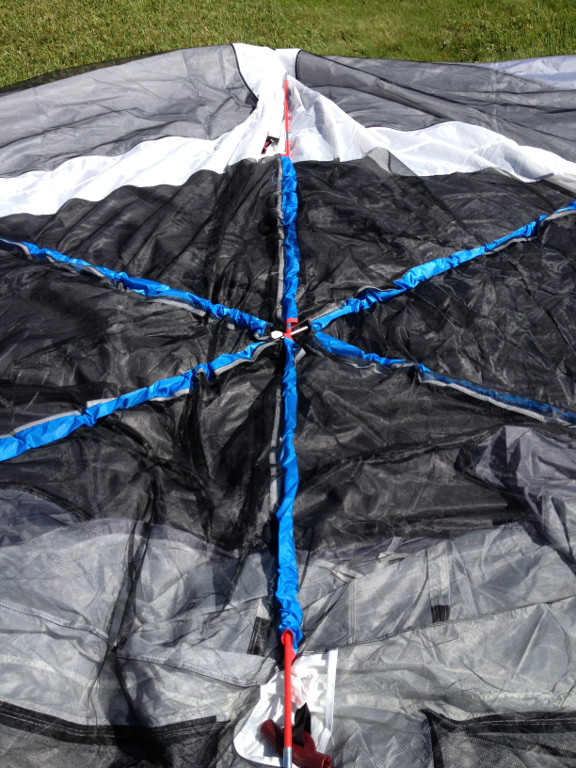 Once this is complete, use the last two stakes to secure the back and front center ground rings. 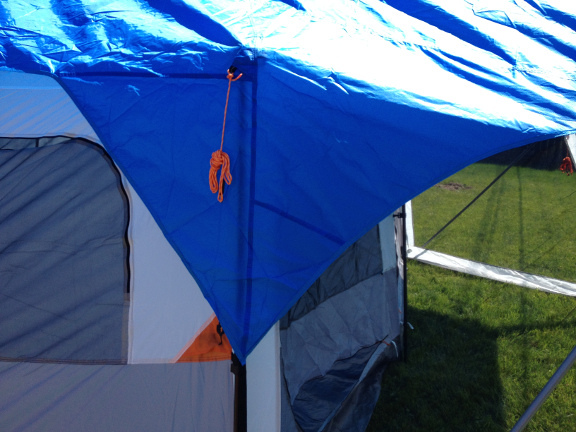 Walk around the tent and check the Velcro straps to be sure they didn’t slide on the poles. Also check the orange tie downs for tensions. The total assembly time was about an hour for the first try. Now that I have done it once, I would expect to do it in about half the time.